Must not lose...dare not lose - that’s how high the stakes are this weekend as Wigan Athletic travel to relegation rivals Reading. And centre-back Chey Dunkley admits Latics are determined to maintain their advantage over the resurgent Royals, whose form has picked up of late. “Reading are down there with us, and these are the games you don’t want to lose,” Dunkley said. “We believe we’ve got what it takes to remain at this level and it’s up to us to prove it. “We’ve not been in the bottom three all season – and hopefully that continues until the end of the season! “For all the work that went into getting promoted to this level, we don’t want to be giving that away. Paul Cook at least has the luxury of a full-strength squad to choose from, giving him selection problems of the welcome kind. 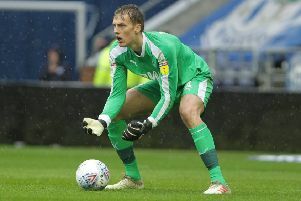 And after snuffing out high-flying Middlesbrough at the weekend – with Latics adopting a new-look 3-5-2 formation – Dunkley says the players are aware of the need to perform to hold on to their shirts. “The gaffer is utilising his squad well, and it’s just nice to be in that first XI,” he added. “Saturday was the first time this year we’ve started with a back three, and it’s good we were able to implement the plan so well.